Effective goal setting is one of the most important habits you can develop. It is the core skill for achieving success in your relationships, your health, and your profession. So why is it that many of us never get around to doing it? 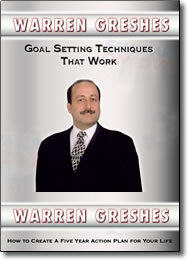 In this fast-paced, entertaining session, Warren Greshes presents a proven system that takes the guesswork out of goal setting. He will show you how to set your goals correctly, and then actually lead you through the process of starting your five year plan. If you know you need to get clear about your future, but haven’t yet clarified your vision, this program will give you the tools and motivation you need to get started now.